It's here. It's finally here! After twenty years of general waiting, and two years of baited breath, Wasteland 2 has finally arrived. And it. Is. Glorious. I'm going to try to keep my nostalgia goggles on the shelf, and try to keep my biases in check, even though it's more than a little difficult. Way back in 1988, Interplay and Electronic Arts released Wasteland. The game is centered around the Colorado River, straddling Arizona and Nevada. It's seventy some years after a (then) unexplained nuclear war that devastated the world. A team of Army Engineers, seeing the world coming to an end all around them, took over a nearby federal prison, kicking out all the prisoners. Over time, they invited in nearby survivalist communities to join them, eventually forming the Desert Rangers. Your party, the famed Desert Rangers, have been assigned to investigate a series of disturbances in the desert. After several strategy meetings, you’ve decided to search for clues in Highpool, the Agricultural Center, and the Rail Nomads’ Camp, all of which are located to the west of Ranger Center. There you go. That's all you get to start with. Go west young man indeed. However, as you play through, the plot does a great job leading you from place to place, giving you teasing little pieces of information, slowly filling in the broader story. Highpool and the Ag Center help you get a few levels under your belt. The Rail Nomads lead you to Quartz. Quartz leads to Needles. Needles leads to Las Vegas. Las Vegas gives you the real plot and carries you the rest of the way to the end of the game where you save the world. It's brilliant. Absolutely and completely brilliant. Even with the technical limitations of being forced to dump the majority of the game text into a separate book, and the minimal graphics, it still comes together like a finally oiled machine. In a way, it lets your imagination take over, filling in the blanks and making it greater than the sum of its parts. I still play Wasteland twenty years on, and I still find new things from time to time. Book four. The book that caught me off guard. I got all the way to the end of book three before finding out that, Nope!, it wasn't going to be a trilogy after all. We're looking at five or six books here. 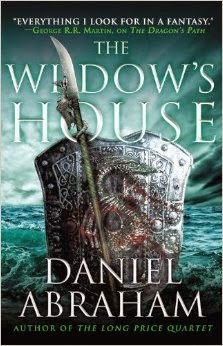 The Widow's House is the latest book in Daniel Abraham's Dagger & Coin series. In many ways, this series is what I wish A Song of Fire and Ice was. They're both sprawling epic fantasy, they're both in worlds that were in decline, they're both war-torn settings, they're both told through a series of point-of-view characters, they're both (mostly) low-fantasy -- as opposed to Tolkien-like or D&D-like high fantasy. These similarities aren't too surprising, considering the connections between the two authors. It's just that I like Abraham's world so much better, I like his writing style better, and I like that fact that he seems to have an end-game in mind; not just in mind, but in sight. This world is very well designed and complicated. Complicated enough that I needed to make a cheat sheet for myself, but unlike SoFaI, it's not from a jillion characters with eight different names, it's the fact that he's not quite as low-fantasy, so he has multiple races. He has his orc-alikes, his wolf-people, his elves, his dwarves (sort of), so on and so forth. However, since there's thirteen or fourteen different races, it can be a bit of a blur. Thankfully, every book has an appendix at the end listing all the races and describing them; as an extra bonus, it's written by a highly biased in-world scholar, which makes it a little amusing. I finally got around to watching 9. 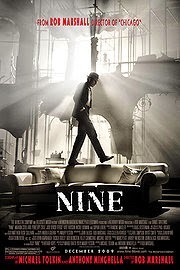 That's 9, not Nine. Ahem. Anyway. A little plot outline is necessary here. At least, it was for me, because, even though 9 is five years old, I went into it knowing almost nothing at all about it. I knew it was animated and it involved this little hackysack dudes, but I didn't really know anything else. Like that it's a post-apocalyptic movie. Yeah. Did not know that. It's an interesting world they've created (er, destroyed?) here, too. During the movie, we learn that it was a standard "machines gone mad" world. The imagery of the pre-fall world makes it look like the nation in question was... well... the Soviets by any other name. Sure, they're using different iconography, and nobody actually uses the words, but, well, "The Chancellor" has certain similarities. Anyway, we have the classic "good science twisted" motif where The Scientist's creation, an intelligent, self-replicating robot, is used for militaristic means. This leads to massive amounts of war and, eventually, the robots turning on man and wiping out all life. All life. The toxins used by the machines even wiped out bacterial life on the surface, leaving the world sterile. Also, somehow, the machines were deactivated in all this. It's never really explained what happened to them, but there's really no life of any kind left. You have the stitchpunks (our hacky sack dolls) and a catlike robot monster thing. Our story focuses on the titular 9, the last stitchpunk created by the Scientist before his death. He's a bit of a naive prat, to be honest. This movie is certainly a case where the supporting characters are more interesting than the main character. Hell, even 8, the dumbass brute was more enjoyable than 9. 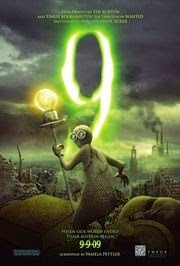 Maybe it's because 9 is voiced by Elijah Wood. When Elijah's being earnest, you just want to pop him in the nose. Aside from Elijah Wood, there are problems with this film. While it's absolutely gorgeous to look at, the plot is weak and elements of it are far too metaphysical for my tastes. When the story started, it was great. I was totally sucked in. A little past the half way point, the wheels started to fall off. Which, honestly, isn't terribly surprising. Reading up on the short film this was based on, the great parts were mostly retreads of the original short. It's when the story expanded that the problems start to crop up. Not just the stuff with the souls, but the fact that events in the movie require people to be damnable idiots. 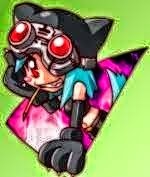 Perhaps it's because of how the stitchpunks were created, but it's still pretty weak, and it's frustrating watching things being stretched out because someone did something stupid. Especially when the movie's only about 80 minutes long to begin with. Still, it's beautiful to look at. The blasted world looks great. I'm glad I saw it, flaws and all. Oh, what a lovely sight. 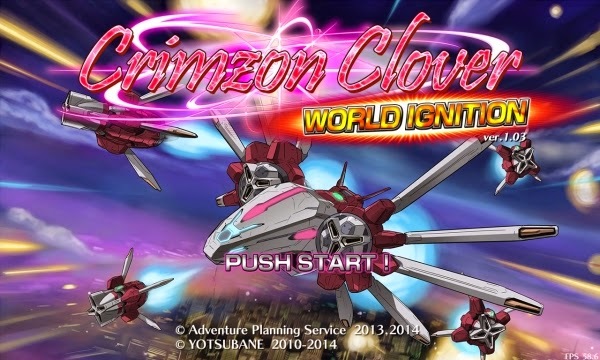 What a great title: Crimzon Clover World Ignition. Yes please. 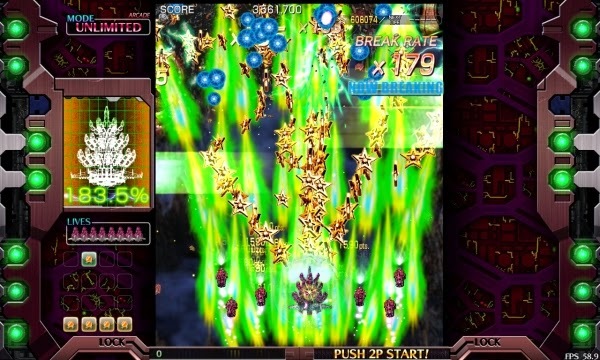 That's me at the bottom there; my ship in the middle and extra shooty things on either side. 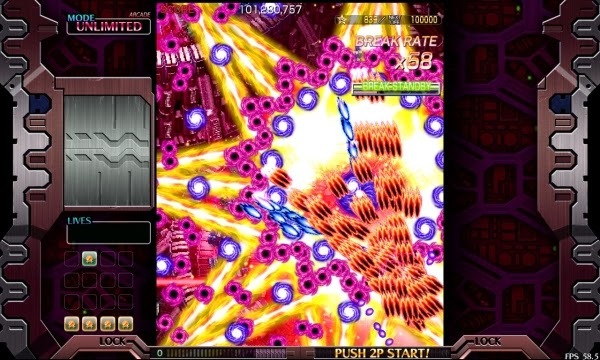 All that radioactive green is me shooting, the gold stars are points, the blue circles are bad-guy shots. You... you can't really see any enemies in this screen shot because I'm kind of annihilating everything here, thanks to the game's Double Break mechanic. Get used to seeing this. So that's Crimzon Clover in all it's glory. Sure, there's a plot, technically ("...you're launched from a sub because ATLANTIS"), but it's really all about the scrolling mayhem. I could get into its arcade history and so forth and so on, but that's really beside the point, and anyone who cares can hit up Wikipedia (and they probably have it already). 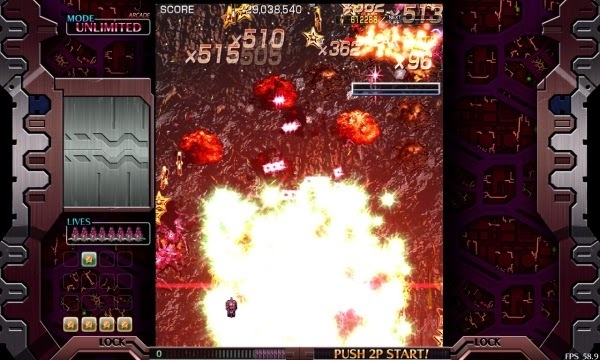 However, thanks to its arcade roots, this feels like a throwback to the 80s heyday of the shmup. It's not trying to be poetic or really do much of anything new (although the Break mechanic is really awesome), it just wants to be a great game you can just lean back and enjoy. There's something great about utterly demolishing endless waves of weird ships, plants, and tanks. You could do a lot worse for $10. You may or may not have heard of Athanasius Kircher, but his impact has certainly been felt in the world. He was a 17th century Jesuit priest, polymath, scholar, prodigious author, and general source of knowledge and wisdom across the world. And he was, by most accounts, wrong about just about everything. 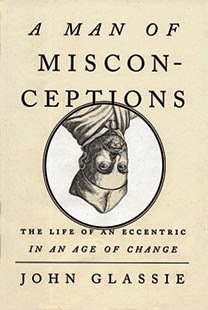 Of course, being wrong about just about everything in the mid 1600s wasn't terribly uncommon. Everyone "knew" plenty of things, but those things turned out to be quite wrong. But yet, despite it all, Kircher laid more foundations than he ever could have imagined, and many of those foundations were responsible for new discoveries, or expanded knowledge. In a way, it's almost unbelievable how he could be so wrong, yet be responsible (even indirectly) for people discovering the truth. To say nothing of the numerous things that he was so close on, but still short the mark. Creature (2011) is not a good movie. I don't know if it was even trying, but it's not good. You should probably call it a bad movie. But I think it deserves to be considered a Bad Movie. You see, there's a difference between a bad movie and a Bad Movie. Bad Movies are the stuff of legends and have entire websites dedicated to them. Bad Movies are things like Plan 9 From Outer Space or Future War or The Giant Claw. They're movies that wrap around bad and become entertaining again. I'm not entirely convinced that Creature manages this feat, but it certainly comes close. I could see having it be part of a group movie night and providing entertainment. Just... probably not the entertainment the creators intended. But, I have to say, don't trust all the reviews you've read. Some of them seem to have decided that they weren't going to like it, and thus didn't really pay attention. You can't really complain about plot holes or bad reveal orders if you weren't paying any damn attention and missed explanations or missed entire conversations. It's honestly rather embarrassing, especially when it's from critics I respect who I would expect to hold a sliver of professionalism. Honestly, if you can't be bothered to watch the damn movie, maybe you should lead it off your list and just skip it. Just because the movie was a dismal and almost complete box office failure ($216 per screen average; currently the 3rd worst for wide release movies) doesn't mean it doesn't deserve a fair shake. At least if you're going to bill yourself as a professional critic. Right. I'm off my soap box. Time for the movie. Rarely, rarely does a person get to sample perfection. 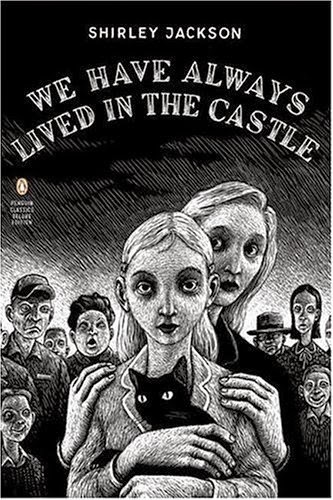 Because I have a tendency to ramble, I want to make that perfectly clear right up front: We Have Always Lived In The Castle is possibly one of the most perfect pieces of fiction I have ever read. It is pure brilliance, and the fact that many people have probably never heard of it is nothing short of criminal. No, this isn't hyperbole. Castle is written by the brilliant Shirley Jackson. You know Shirley Jackson. Everyone does. Even if you don't recognize her name, you know her. All it takes is two words: The Lottery. Yes. That Shirley Jackson. As for Castle (billed as a novel, but really more like of novella), well... imagine a haunted house with no hauntings. A ghost story with no ghost. If I had to pin it down, I'd call it the epitome of the weird tale, even though there's nothing supernatural going on. But despite having no hauntings or ghosts or cosmic horror, this story piles on the dread and foreboding in a way few things I've ever read have managed. In many ways, it's like watching two trains steaming towards each other in slow motion. You know what's going to happen, but you just can't tear your eyes away. And as the trains get closer, time slows more and more to just build upon that dread. This isn't a horror story; it's a tale of dread and unease, and it's all the more horrifying for it. It's like Thomas Ligotti in the real world, and the real world is terrifying enough as is.